This guide was made for EAC version 1.0 beta 3 and will not completely work with earlier versions (which are not recommended any longer). 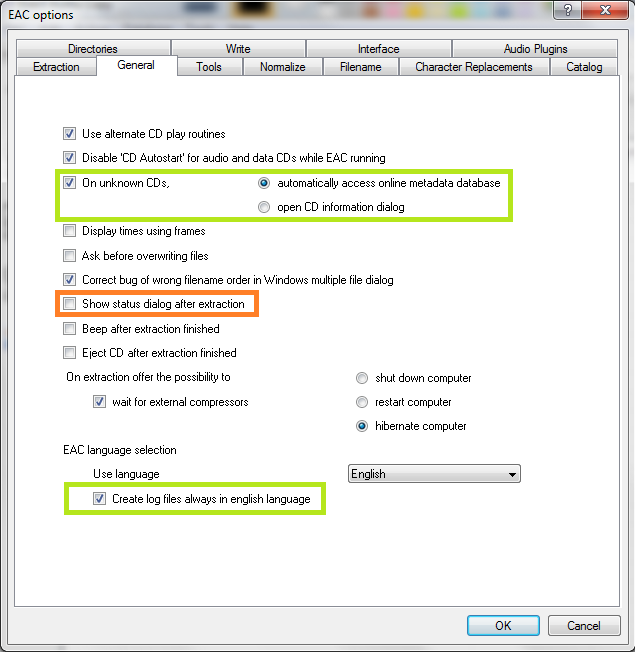 Versions 0.99 or earlier should use the EAC 0.99 guide. 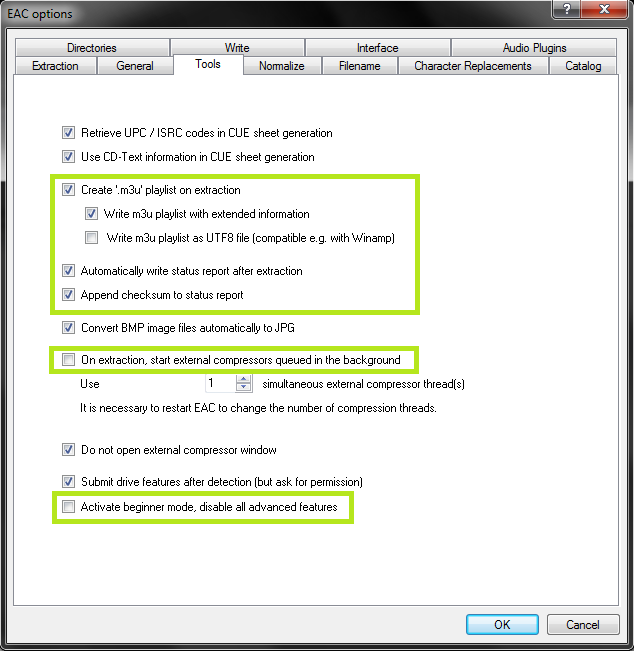 Anything with a green outline around it is a required setting. Anything orange is required but depends on your drive. Anything unmarked is optional. This is meant to be a no-frills guide with little extra info. 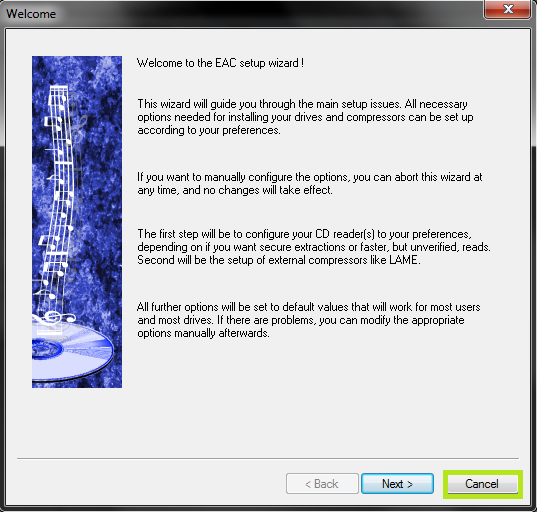 The old EAC 0.99 guide is more comprehensive (but outdated as far as settings go since there are new features in EAC 1.0) - visit it if you run into problems, the background information is basically still correct. Eventually you'll get to a screen like this. Make sure you install AccurateRip, CDRDAO, CTDB and freedb as a bare minimum. 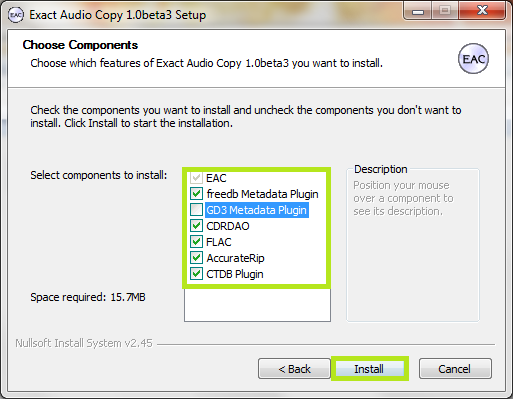 FLAC will be useful as well if you don't have it separately installed. GD3 is only useful if you want to pay for metadata results. I assume you don't. Note: The above screenshot is from Beta 3. The new Beta 3 adds the option to include the CueTools Database Plugin. It is recommended to install it but not required. 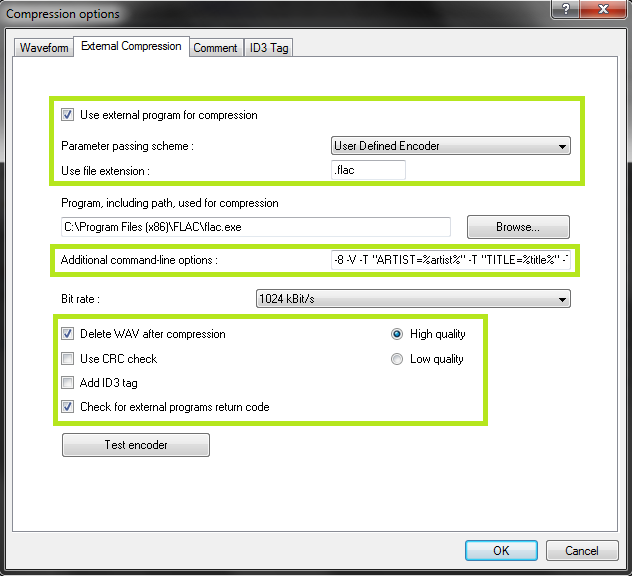 Full details for installation of the plugin on older versions is located in the appendix at the end of this guide. When you first start EAC, you'll see a screen like this one. Hit "Cancel". 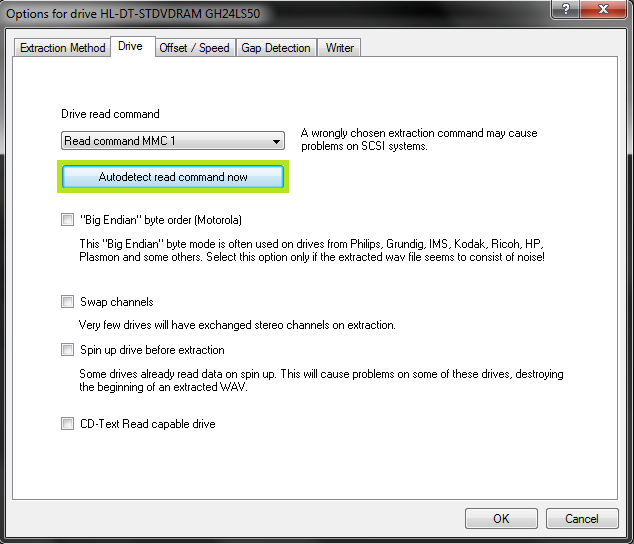 Next, put a popular CD into your drive, preferably not one that was recently released (a few months old at least). You'll see a window like the one below appear. 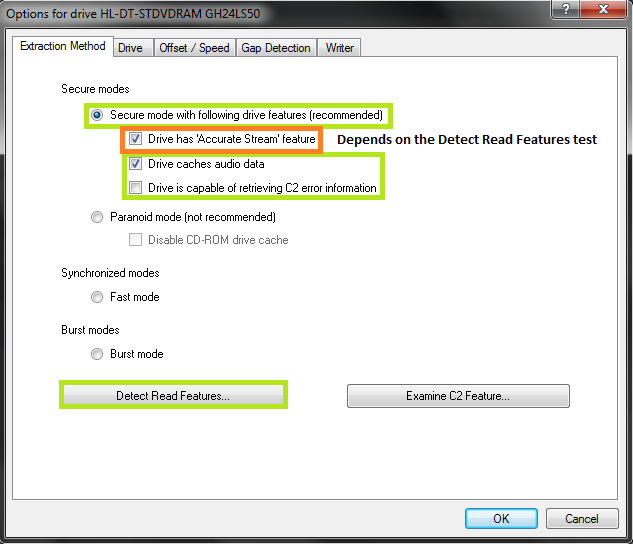 If you have an older version of EAC or dBpoweramp installed, it's likely AccurateRip was already configured, and this may not appear. You may need to try multiple CDs to get this to show up. Hit Configure. It may take a few minutes. Hit "Ok" afterward. This is a necessary step, make sure you try several CDs. 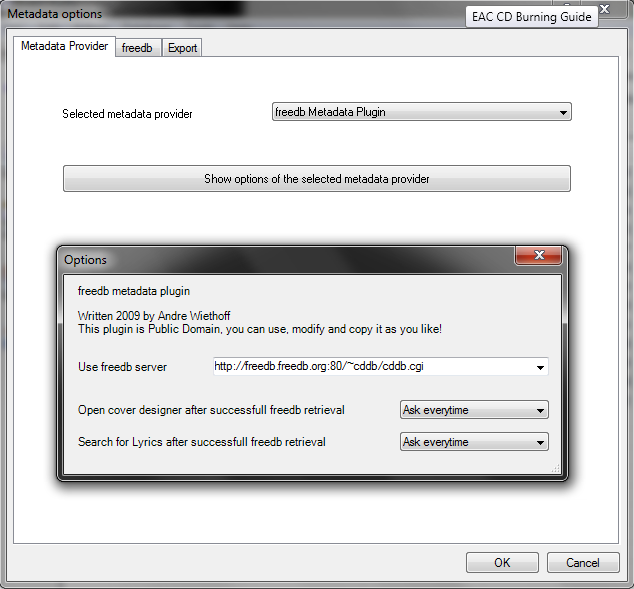 Note that m3u file creation is technically optional, however, some users use these files to manage their libraries. The "Show status dialog after extraction" option setting has been problematic for some users. 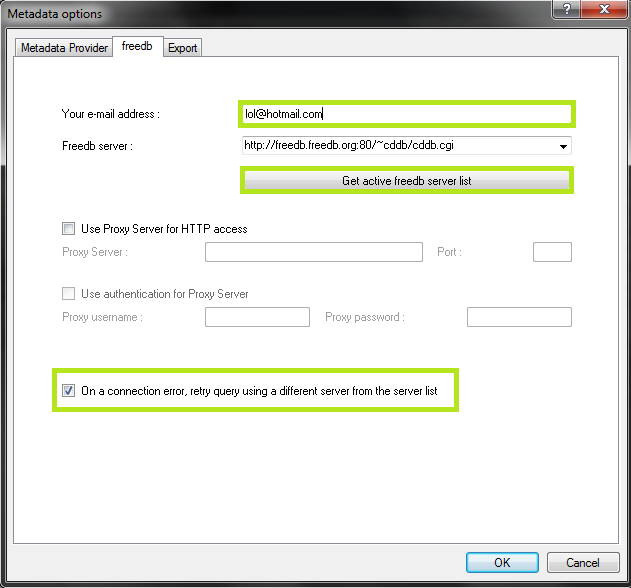 This displays the log after the rip is done, and offers you the option to save the log file. 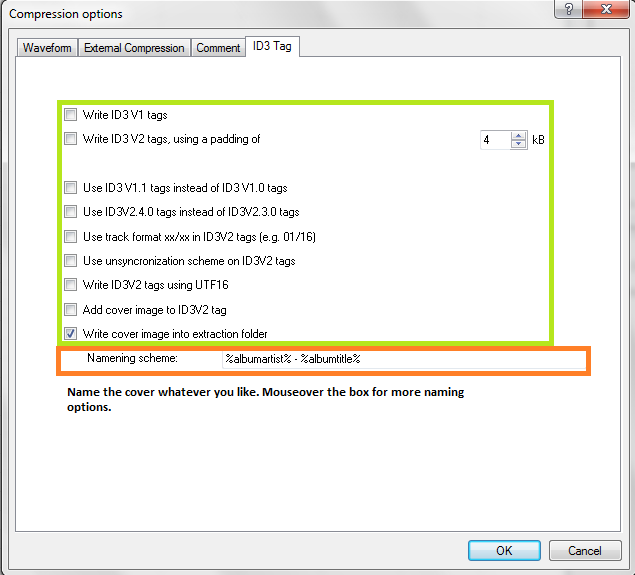 If you follow this guide, EAC will do this automatically. Do NOT hit "Save Log". As such I've disabled the setting here. Only turn it on if you know what you're doing. Friends don't let friends normalize their EAC rips. Don't ever do it. The rip will no longer be a true "exact copy" of the CD. As shown in the screenshot above here is the proper way to name tracks. The only difference acceptable here would be perhaps %tracknr2%. %title% if you prefer periods instead of dashes in the filenames. If you need track numbers to go into triple digits for some reason, use %tracknr3% instead. A note on directory naming schemes and cuesheets:: Don't use a directory structure in your EAC filename options, unless you want to go back and edit your CUE sheet later. When you add a directory to the naming scheme, it'll put that directory path into the files. When, at a later date when you may have moved the files, you want to burn the files in EAC using your cuesheet, you'll be unable to do so. 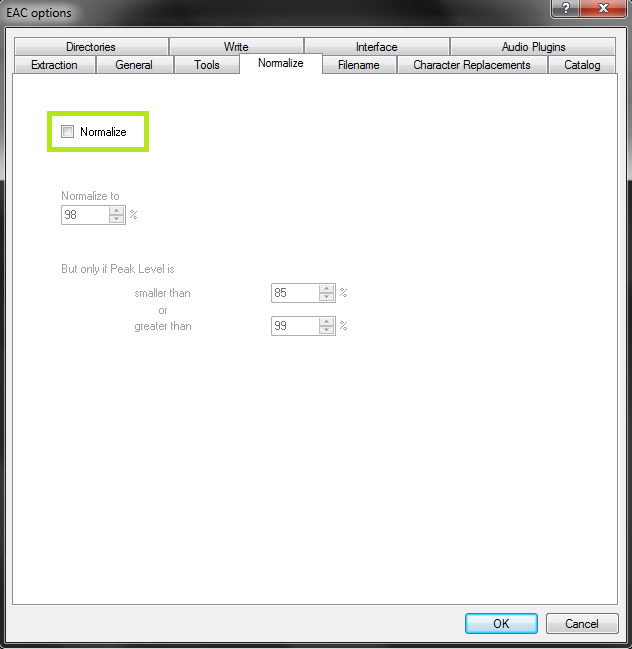 If you do insist on using a directory structure here, you need to go back, edit the CUE sheet in a program such as notepad, and remove the folder name from each line. Follow the listed items on the Filename tab if you prefer a different scheme. 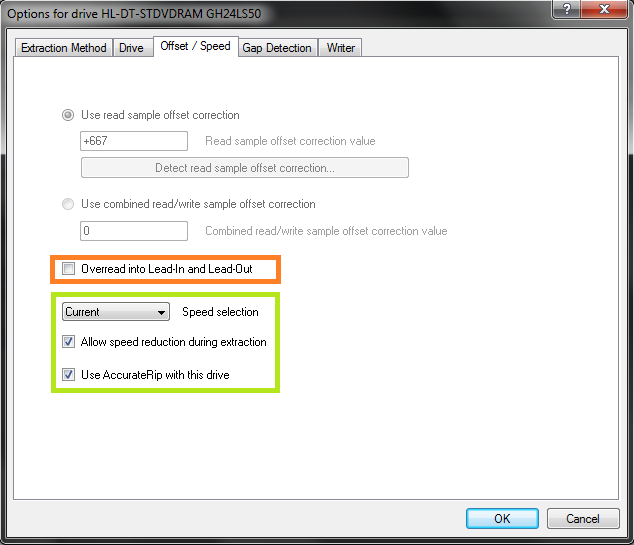 Even if your drive doesn't cache audio, it will not harm the rip quality to leave that checked. The rips take a bit longer with that setting enabled, though. Go watch TV or something while you wait. 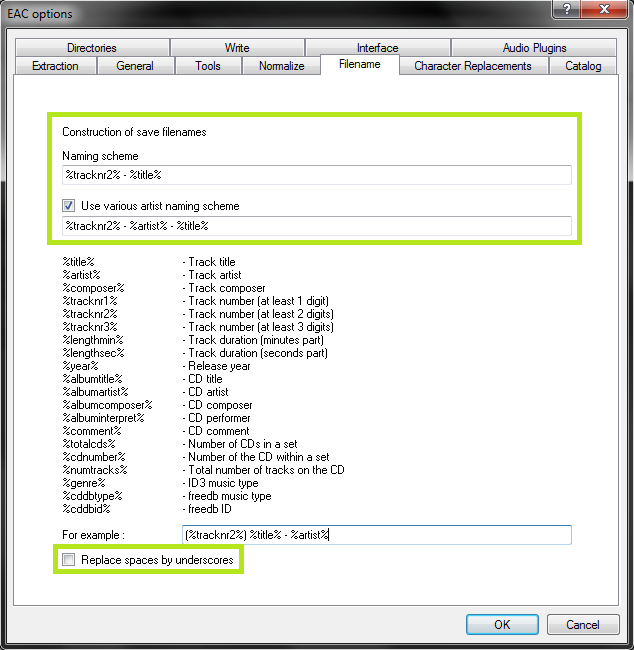 If you did the AccurateRip configuration at the start of this guide, the top half here will be greyed out. If not, you'll need to find your read offset correction from this list. 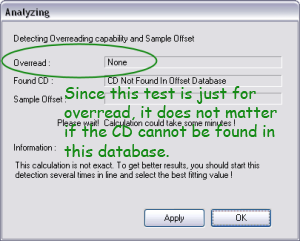 Don't use a combined read/write offset. AccurateRip is a very useful function for checking that your rips are OK, so you should go back and try to get it configured if this option isn't greyed out. 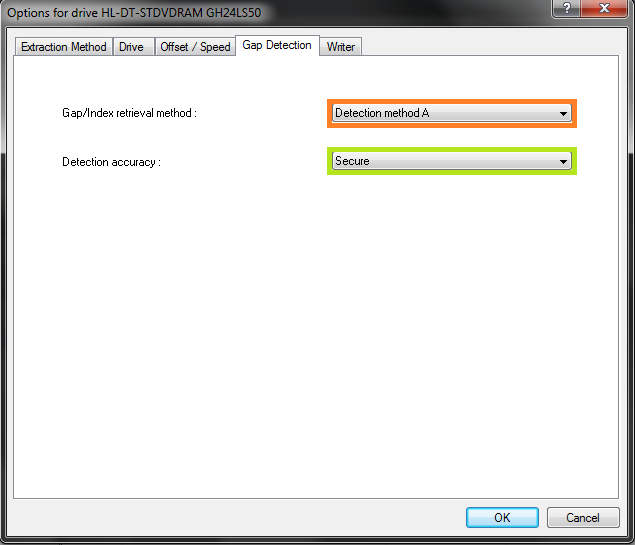 Remember to check "Use AccurateRip with this drive" again once you're finished. Set up this tab exactly as shown. 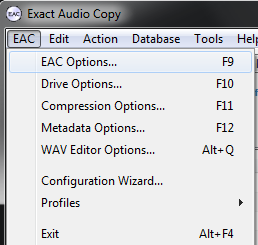 You'll have to browse to the path where you have flac.exe, if you installed it with EAC it's in C:\Program Files (x86)\Exact Audio Copy\FLAC\flac.exe. If you installed it separately it's wherever you installed it. 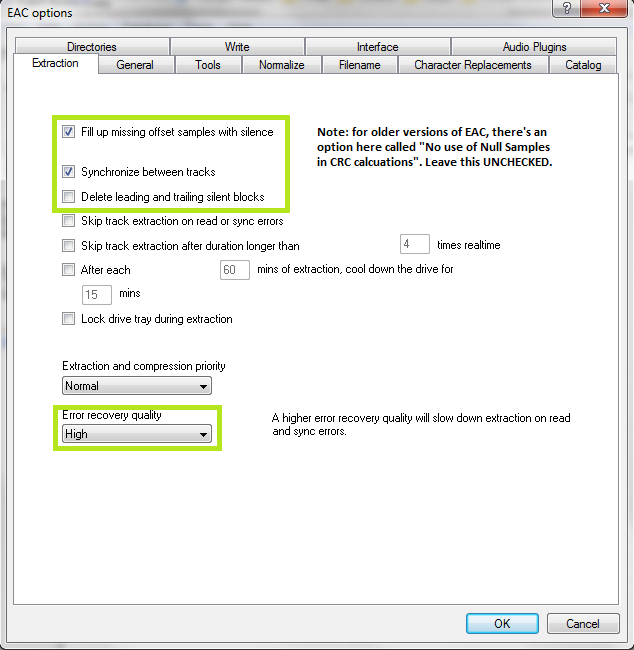 The bit rate and high/low quality have no effect on the rip.